I’d rather be having a beer! Not really the classiest mug in the NYC apartment I’m staying in but definitely my favorite. Besides the motto it’s hard to beat “bandaid” for drinking vessel color. To make things even lamer (relatively), it’s Caf Lib and not even coffee. 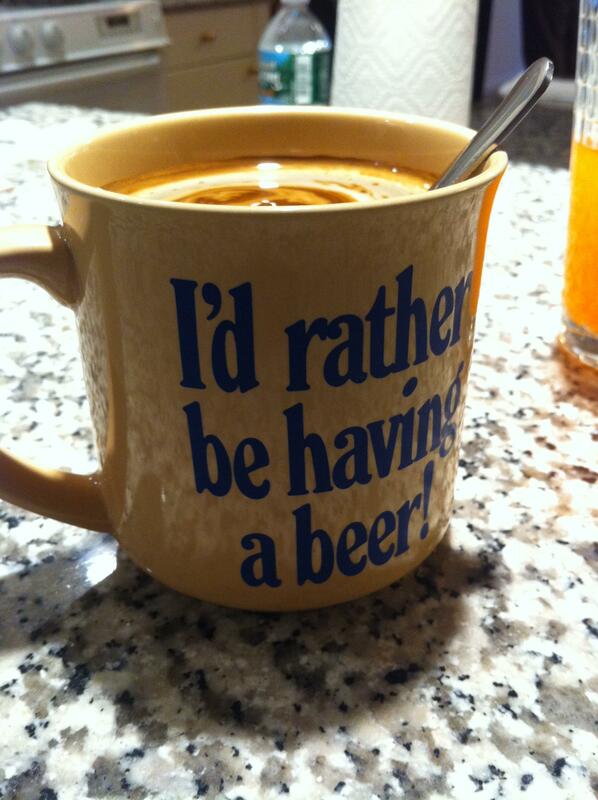 Are there mugs that say “I’d rather be having a White Russian”? And if yes, why didn’t you get that mug instead? I think I see a way in to the novelty mug market opening up for you here. Ian my name is Brian. I am a firefighter outside of Chicago. I broke my engineers coffee mug exactly like the one in this feed. He has had the mug over 20 years and I feel terrible about it.Any chance you still have it and would be willing to part with it? Aw, man. Sorry, no. This is just something I drank from when we rented an apartment in NYC for a work retreat. Hopefully it’ll turn up on Ebay!